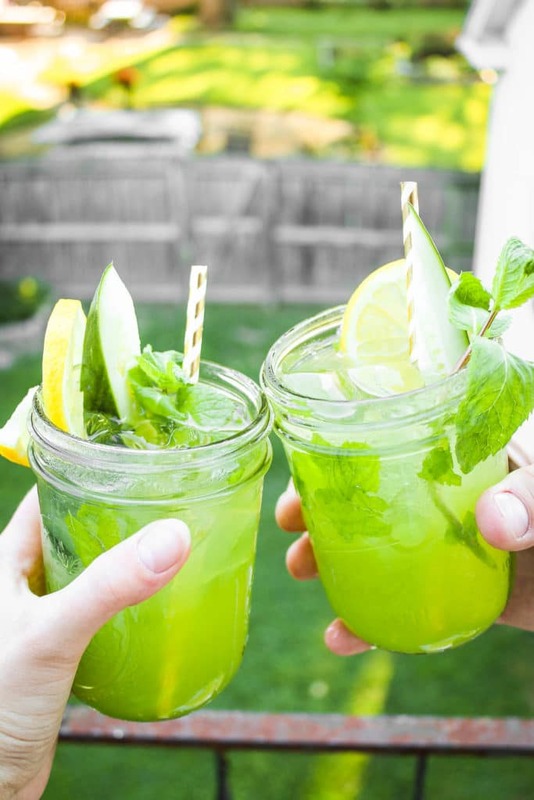 This cucumber vodka lemonade recipe is a cool breeze on a summer day. 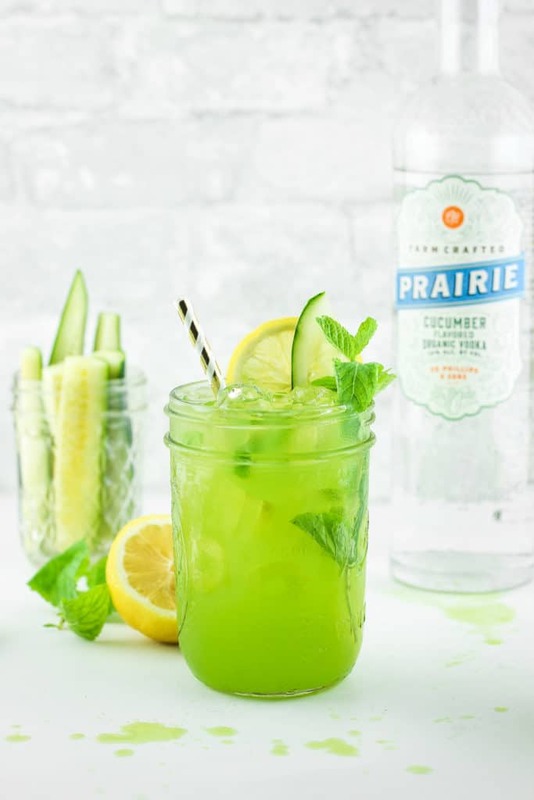 Fresh cucumber, sweet + tart lemonade, and a splash of super smooth vodka make this the perfect cocktail for bonfires, dinner parties, or date nights. THIS. This is summer. It’s hot. 95 degrees hot. It’s fireworks for half the month of July, and maybe some of June too. It’s going to the county fair for a pineapple whip because, why not? It’s watering the flowers 3 times a day. It’s sticky, salty skin and the smell of sweet corn on the grill. It’s a tall glass of lemonade – preferably cucumber vodka lemonade. On repeat. You see where I’m going with this? An adult beverage with health benefits, obviously. Cucumber and lemon? These are good things. I mean, hello – it’s a green drink! 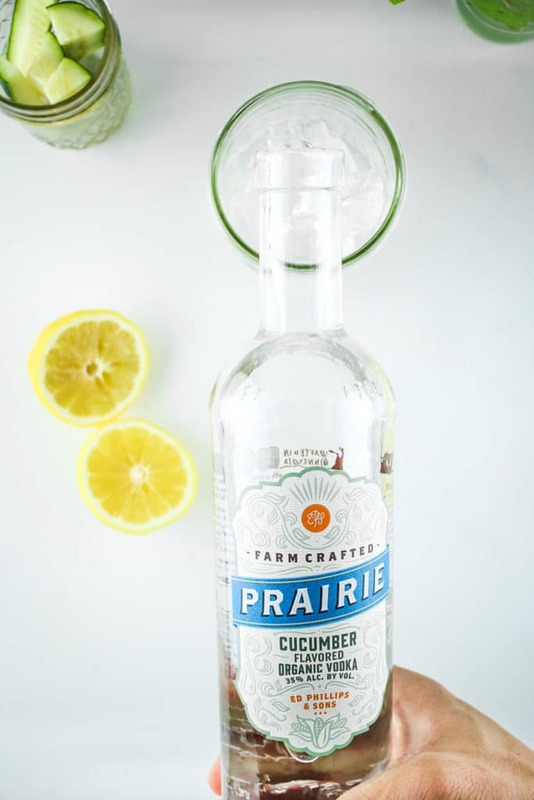 It’s no secret that Prairie Organic is our favorite brand of spirits. 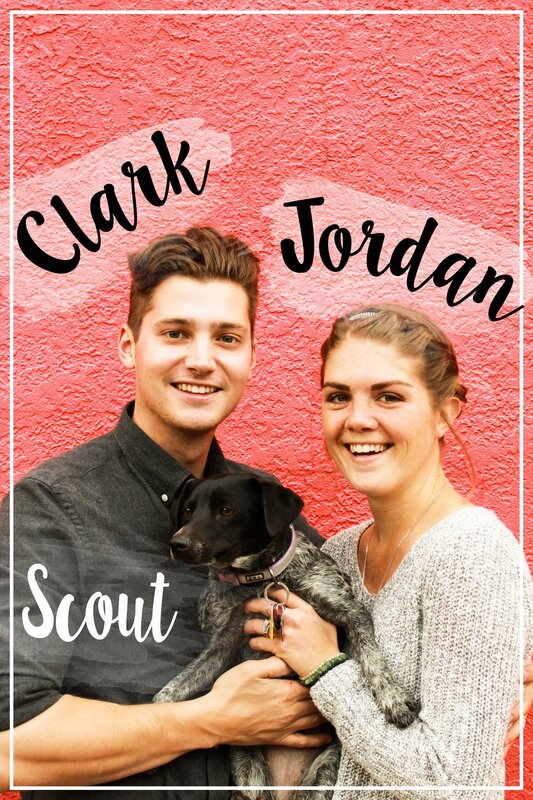 These fine folks are pioneers in their realm – they are one of first USDA Certified Organic spirit brands and they’re holding steady as the #1 brand in the category. That’s what happens when you put care and craftsmanship into every single bottle. When you know the source of every ear of corn and you work with farmers who are committed to providing the highest quality ingredients. This is the kind of vodka that MAKES a cocktail. It’s award-winning for obvious reasons – nothing else compares to the distinct, smooth magic that they’ve achieved. 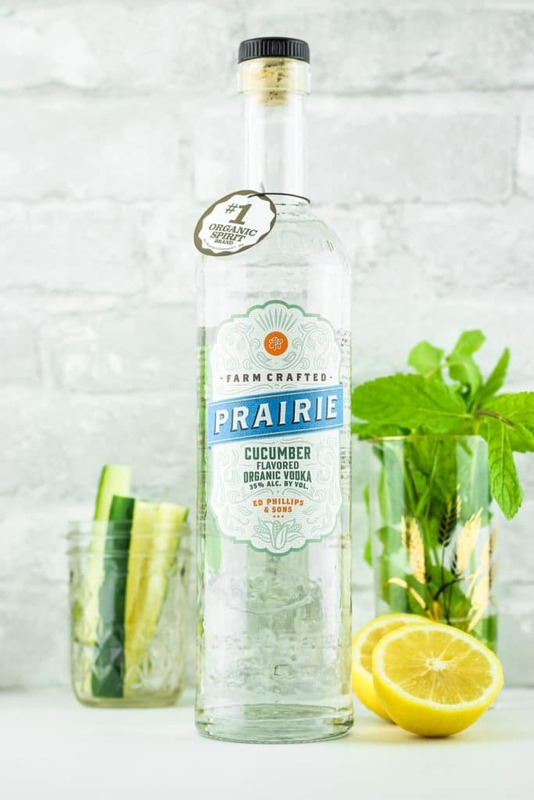 You taste the subtle cucumber just enough and it compliments the refreshing lemon + mint combo for a total home run. This cocktail was concocted with summer bonfires in mind. For nights when the heat backs off and leaves you in that perfect cool-warm temperature that only exists a few nights a year. But to be honest, we haven’t had any of those this year and I am SO not complaining. I speak from experience when I say that this cocktail is plenty delicious on a smoldering Midwest evening. I’m gonna sip this cucumber vodka lemonade on hot summer nights and I’m gonna sip this cucumber vodka lemonade on those nights that melt into fall. A little crisp, a bit muggy, and in need of refreshment. 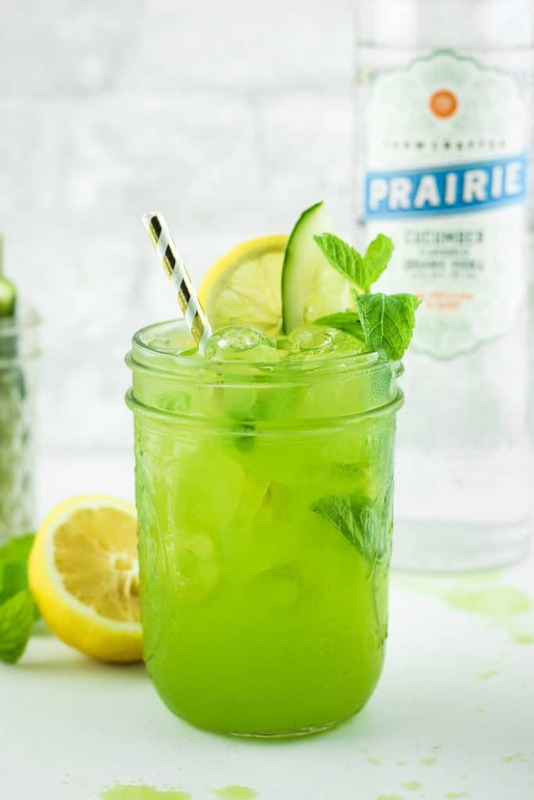 What you need to do is make this Cucumber Vodka Lemonade right now. Or for your next chill dinner party. Or when you have your next date night with bae. Or after you get off work on a Monday just because you can. When you make it, tell me about it! Tag us on Instagram so we can show you off on our stories.  We loooooove sharing the love! In a medium saucepan, combine 1/2 cup sugar and 1/2 cup water. Bring to a boil and then reduce to a simmer, stirring occasionally until all of the sugar has been dissolved. In a large jar or pitcher, add syrup, lemon juice, and water and stir to combine. In a 16 oz. mason jar, add ice. Pour in vodka, cucumber juice, and lemonade. Garnish with fresh mint, lemon, cucumber, etc. and enjoy! * If you don’t have a juicer: chop off the ends of the cucumber and slice the cucumber in half. Add to a blender with a splash of water and blend into a puree. Place a fine mesh strainer over a bowl or glass and pour in the puree. You should get enough juice for the recipe! Love this!! 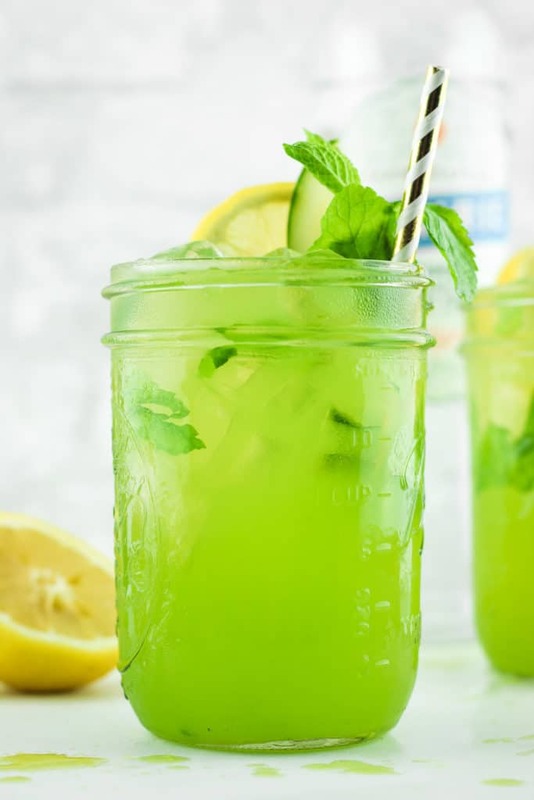 Super creative and the lemonade and mint with the cucumber juice would be so refreshing! It’s such a good combination! After a long work week and too much rain, this cucumber vodka lemonade is just what I’ve needed. Summer may almost be over but it’s never too late for this drink! That looks insanely delish! I didn’t even know cucumber vodka existed. What a creative cocktail. Love it! You MUST try it! It’s so good! Ooooh I like the idea of a cucumber vodka tonic! I’ll have to give that a try. I’m in! 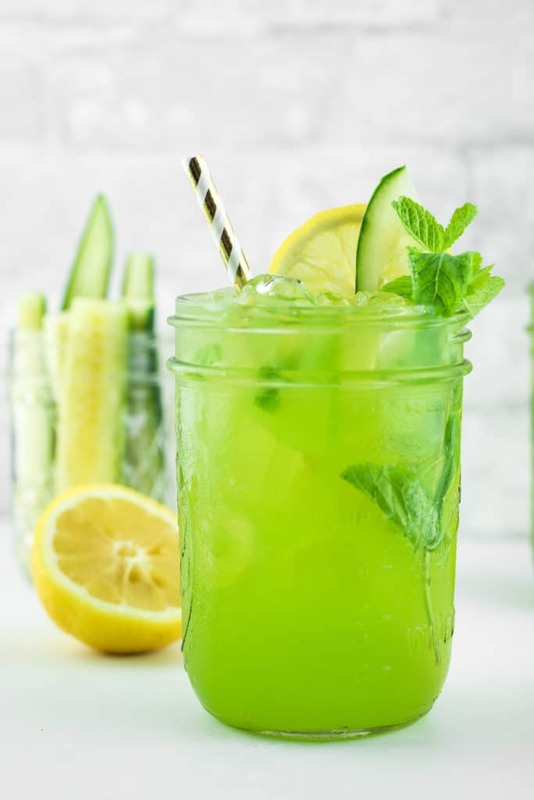 This is a refreshing cocktail and I love that you pair cucumber with lemonade! A brilliant cocktail! Cucumbers and lemons are BFF’s! Oooh the cucumber juice is a great addition to lemonade! I love the spike of vodka too for a more grownup depth. This sounds so refreshing and I love the bright color! Agreed! I love cucumber and lemon together – such a good combo! I love the Cucumber Mint lemonade at Cheesecake factory. I imagine this tastes just as good with vodka. That is a win! Ok I have never heard of cucumber vodka before! I’m definately giving that a try because I love me some vodka! I love the nutritional value here too!! Looks so refreshing!! Yes – you have to try it! It’s such a good addition to so many cocktails. Now THIS is MY kind of green drink!! I love cucumber in cocktails! I tend to pair cucumber with gin, but I bet it’s awesome with vodka. This looks super refreshing and SO perfect for this heat wave we’ve been having out here in New York! Right?! Me too! Green drinks don’t always have to be smoothies lol. I hope you enjoy! I think I really do need to make this recipe right now. This sounds like a winning combo! I’ve been super into cucumber drinks lately. I’ve always loved lemonade vodka drinks. But why have I never combined the two?! Such a good idea! I’m 100% making this. Oh you will definitely love this cocktail! It’s right up your alley!